The following books and videos provide a feast of reading and viewing for people interested in wolves. 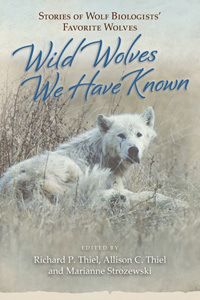 Our online Wolf Den Store and local book stores and libraries also have many of these titles available. Some of the books are out of print. However, all of them can be purchased (used copies) through online book vendors at a fraction of the original price. An asterisk denotes selections that may be interesting to teenagers as well as to adults. The inclusion of a book on this list does not imply an endorsement by the International Wolf Center. Fiction and non-fiction books and stories can convey misleading or inaccurate information about wolves. So can movies and documentary films. We encourage readers to seek out science-based information and to learn what is true and what is not about these fascinating animals. If you find that you do not have time to read all of these books and would like some help with your selection, we have highlighted some in green to help you make your choice. The books on this list provide comprehensive information about wolves for readers who are interested in wolves and for serious students of wolves. We suggest a search on the site of an online bookseller to check out content or a visit to a bookstore where many of these books will be in the nature or animal section. University of Minnesota Press Purchase. University of Chicago Press Purchase. U. S. Government Printing Office. Falcon Press Publishing Co., Inc.
*The Wolves of Isle Royale: A Broken Balance. Springer Science + Business Media, LLC. Few books for adults only have been written about the red wolf, but the collection of information is growing as awareness grows about this critically endangered animal. Several books for young people have useful information for readers of all ages about North America’s other recognized wolf species. *The Red Wolf: Help Save This Endangered Species! University of California Press Purchase. Waiting for Wolves in Japan: An Anthropological Study of People-Wildlife Relations. Novels and stories about wolves are forever popular. Some reflect the reality of how wolves live. In others, wolves take on human characteristics and feelings and forge connections with the people in the story. Some wolf fans think that is a disservice to the “real” wolf; others do not. We encourage readers to explore the world of wolves through fiction as well as non-fiction and to learn about these remarkable and resilient animals. Guiding children’s reading is both a joy and a challenge for parents and for teachers. Many non-fiction books do an excellent job of making the facts about wolves interesting. In fictional stories and books, the characters and the plot are sometimes highly exaggerated. Many of these books are fun and funny and highly entertaining, especially when they are illuminated with art and illustrations. Some books and stories are anthropomorphic – that is, the animals display a broad range of human feelings and characteristics. Many adults say their lifelong interest in animals began with their connection to an animal character in a book. Parents and teachers who want to foster a love of books in young children will start with read-aloud stories, many of which have survived for generations and which are included on this list. Some are considered classics, and several of the listed books are taught in schools as directed novels. Parents and teachers are encouraged to learn as much as they can about the “real” wolf so they can engage children and adolescents in discussions and conversations about wildlife and nature. Houghton Mifflin Books for Children Purchase hard cover or soft cover. Produced by Trailwood – Landis Films, 1991. Running time 90 minutes. Purchase. Nature – a production of Thirteen/WNET New York and National Geographic Television. Purchase. PBS Nature – a production of Thirteen/WNET New York and National Geographic Television, 2010. Narrated by Robert Redford. Running time: 45 minutes. Available online. Bob Landis Wildlife Films, 2005 and 2006. Nature produced by WNET, 2008. PBS Nature, directed by Klaus Feichtenberger, 2011.